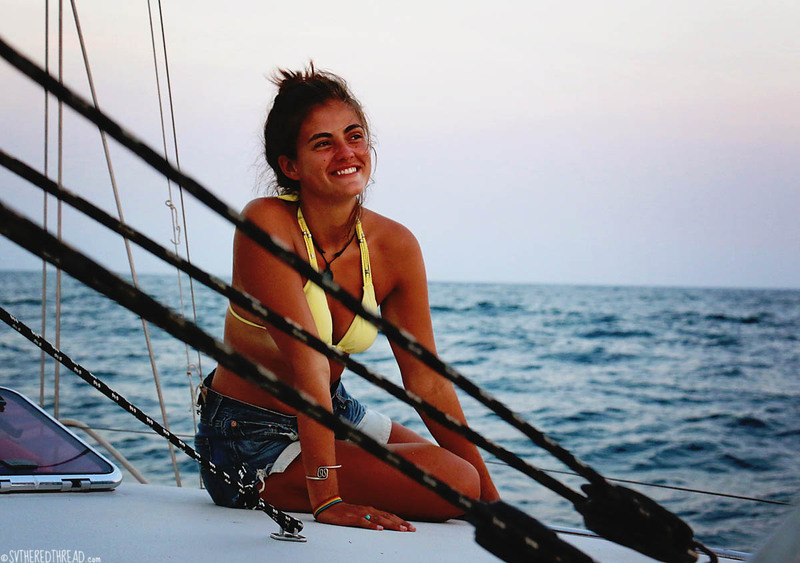 I uncleated our bowline and heaved it aboard, unthreading it from Puerto Barillas’ mooring, to which The Red Thread had been tethered for 17 days. I looked aft over our dirty boat. Weeks without attention in the midst of the estuary, and she was grubby with a film of dirt speckles along her fiberglass decks. Neil put the helm hard over and we began our exit from the estuary. We were departing El Salvador on a hot blue-sky day, with two new crew and a couple of giant rucksacks shoved beneath the salon table. You’ve never met a more pleasant “vommer” (as Emma called him) than dear Tim. While most people would’ve been complaining and whining in misery, Tim lived up to the British stereotype of being overly apologetic. Brits hate to make a fuss, and Tim apologized profusely for his own misery. 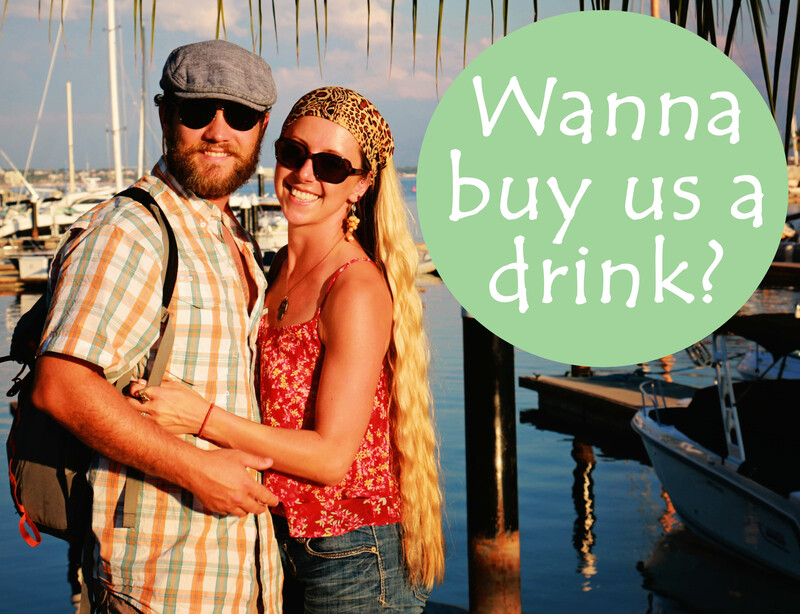 Tim, you can be sick on our boat anytime. Tim at his worst is better than many at their best. 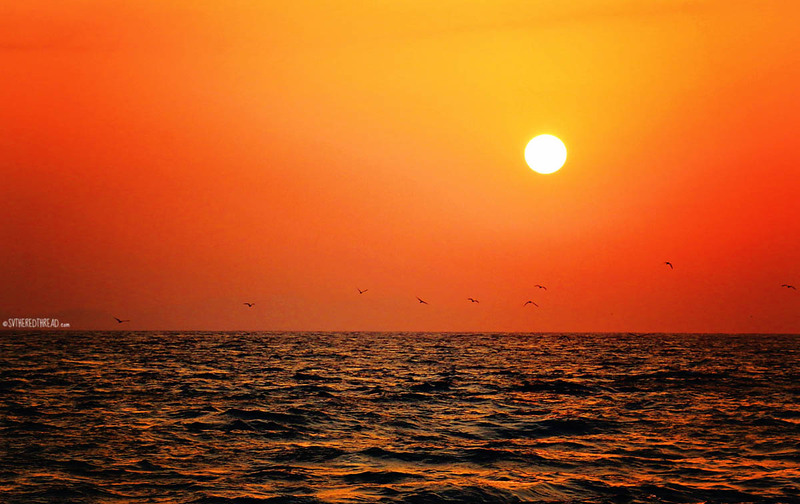 The sun retreated from the sky and the horizon erupted in a burst of orange. 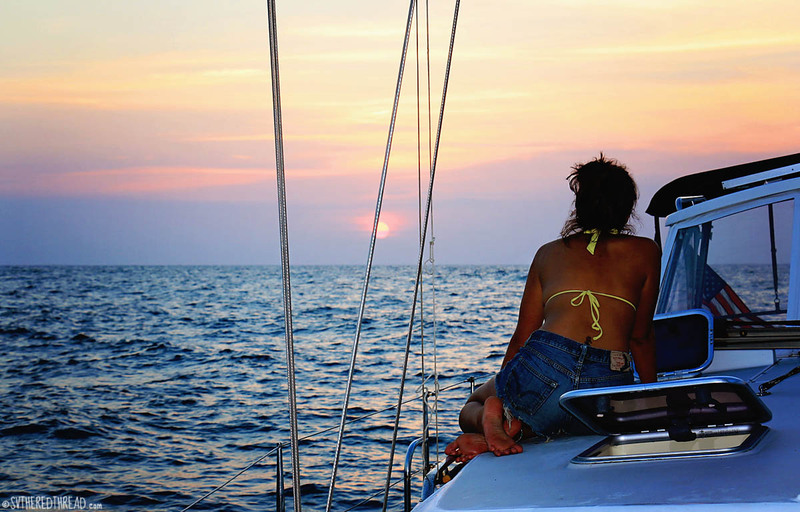 Dolphins dipped and dove in the distance, and we settled into the rhythm. For the next several hours, the cockpit hummed with banter about British and American politics. Impassioned perspectives about the pros and cons of ours nations’ social perspectives were voiced and dissected. Neil, in particular, embraced the opportunity to share rich dialogue with two people whose viewpoints are as passionate as his own. As is our routine, Neil took first watch and was immersed in discussion until our crew, whose only job for the single-night sail was to enjoy the experience, drifted to sleep in the cockpit. I woke at 2 am for my watch. My belly had mostly settled, and I was rather amused to emerge from the companionway to see our new friends snoozing away as we entered Nicaraguan waters. We sailed for several hours during the night, but the wind was fickle. Motor on. I dropped both fishing lines at dawn. The sunrise was fiery and seabirds tore through the sky, welcoming the morning. Tim and Emma began to stir. By first bite, we were all awake and in delightful spirits, with wild hair and unbrushed teeth. We tossed Tim the fishing gloves. He’d never caught a fish. Watching Tim handle the wriggling skipjack was comical and sent laughter around the cockpit. 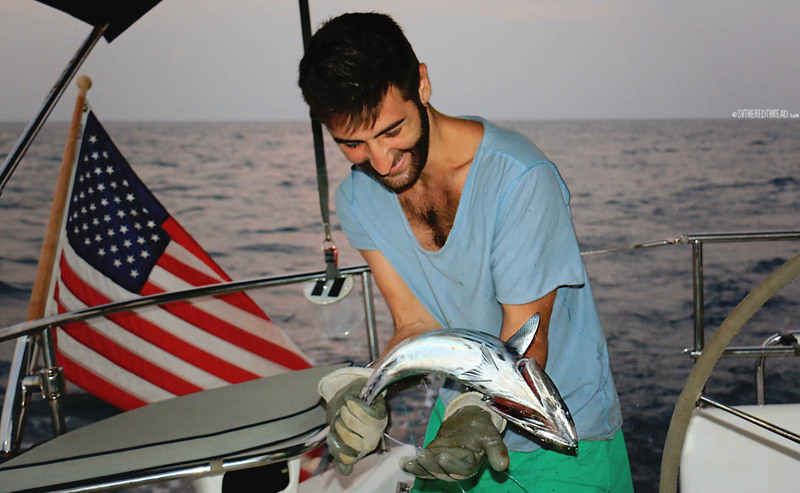 Dark-fleshed fish are not our favorite, however, so we let the little guy loose. What the hell is that?!? Minutes later the line went taut again. Brilliant! Emma would get a chance to pull in a fish, too! She tugged on the fishing gloves, smiling widely. She is fit and strong, so we were surprised when she struggled to haul in the line. Perhaps it would be a big, spunky tuna! As the fish was drawn closer, our excitement morphed into inquisitive nervousness. It was big. Really big. Neil and I looked at each other, “What the hell is that?! ?” It had teeth. Big teeth. Lots of big teeth. We’d learned our lesson with the great marlin tragedy off the central coast of Mexico, and we now had better ideas about how to handle a gigantic dangerous-looking fish. I took over pulling in the fish; Neil gaffed it. He then handed the gaff off to me, and I pulled it alongside the boat, while he looped a slipknot around its tail. We then released the line, dragging it backwards until it mostly drowned. Next, we pulled it in close, Neil slit its throat from the swimstep, and we allowed it to bleed out in the water before pulling it aboard. Was that too graphic? We were not about to risk having a half-dead, fang-toothed sea monster on a last-ditch-to-survive rampage loose in the cockpit! The beast stretched almost the full length of cockpit. After immortalizing the epic fishing event with photographs, Neil set to work at the butcher block. The spinal column was the size of size silver dollar, and he filleted nearly 15 pounds of meat from the animal! I tried to figure out how we were going to fit all of the meat in the refrigerator. Based on our fish identification guide, we were quite certain that we’d landed a pacific barracuda, and a near world record one at that! It turns out we were wrong…read on. Buenas dias, señors y señoras! The waypoints in our Sarana Cruising Guide were spot on, and we made our way into the estuary without issue. 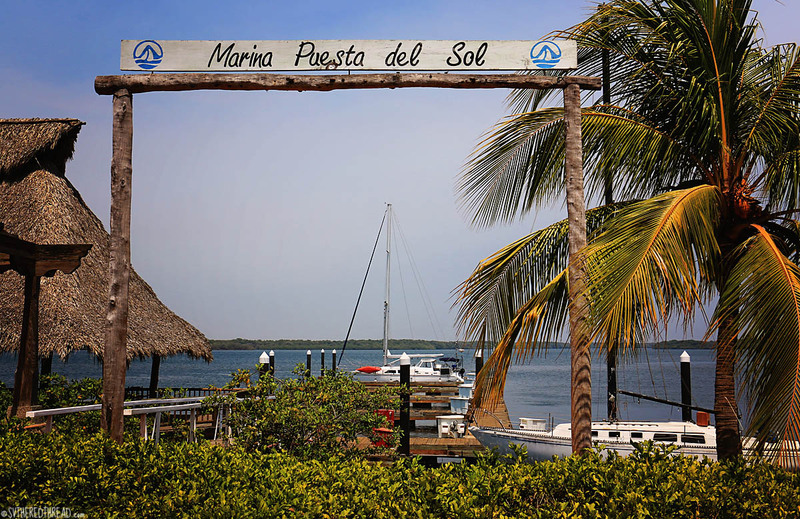 We motored into Puesta del Sol, Nicaragua’s only Pacific marina, in the late morning. As during arrival to Puerto Barillas, officials climbed aboard, one after the next. Their professionalism was as neat as their smartly pressed uniforms. That is, until we showed them photos of our dramatic morning catch, which evoked nods and gasps of approval. 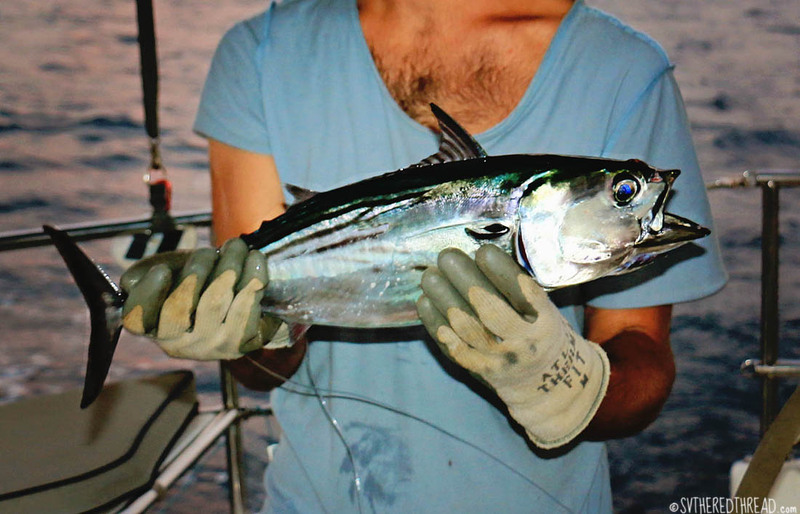 An unspoken rule about fishing in remote areas is that if the locals will eat it, so will we. They smiled and passed around the image, commenting in Spanish about its deliciousness. We paid our clearance fees in cash (they accepted US dollars) and earned good favor by offering each of the five officials a big portion of filleted and packaged barracuda that would feed a family of four. Buenas dias, señors y señoras! 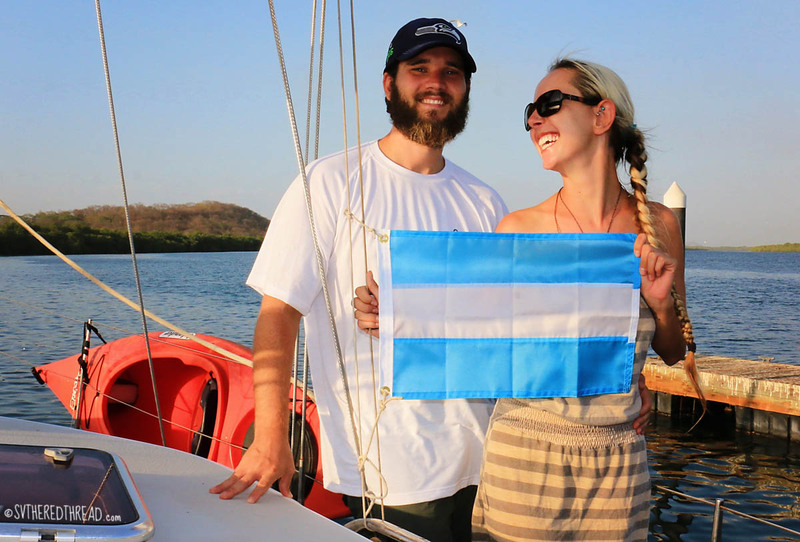 And with that, we cracked a celebratory beer, hugged Emma goodbye as she had an evening flight to catch in Managua, and put Tim to work helping Neil wash the boat. The verdict on el pescado gigantesca: After we got access to a decent internet connection, we sent our story and a photo of the behemoth to Sport Fishing Magazine for confirmation that our catch was indeed what we surmised. 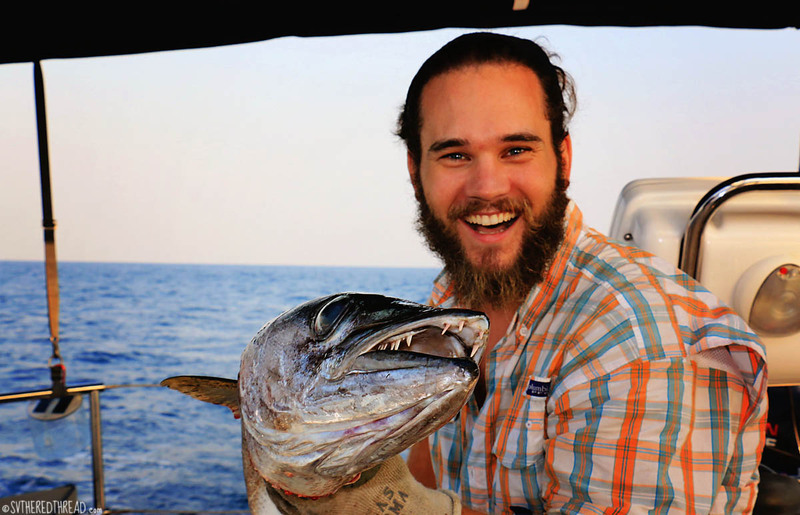 The editor informed us that our prize fish was almost certainly not a near-world record pacific barracuda, as we’d hoped, but he was not sure what it was. He also informed us that our book contained a typo – the world record pacific barracuda weighed less than 10 pounds. He forwarded our email on to the magazine’s scientist, Dr. Love. We were later informed that the fish was a blackfin barracuda, a species that is rather rare in the eastern Pacific Ocean. For that very reason, they will be publishing our photo and story in the Fish Facts section of their winter issue! Pick up a copy. Jessie’s musings: I was giddy to get moving. I’ve come to love night passages, and I missed being on the boat. 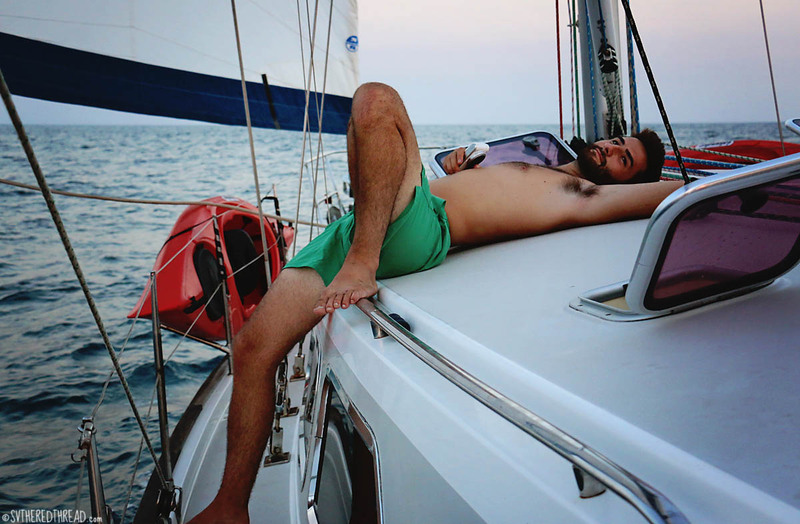 At the same time, we’d covered a great distance since leaving Seattle, and some aspects of sailing had become commonplace; our “normal. Seeing the experience through Tim and Emma’s eyes brought a wonderful excitement to the passage! 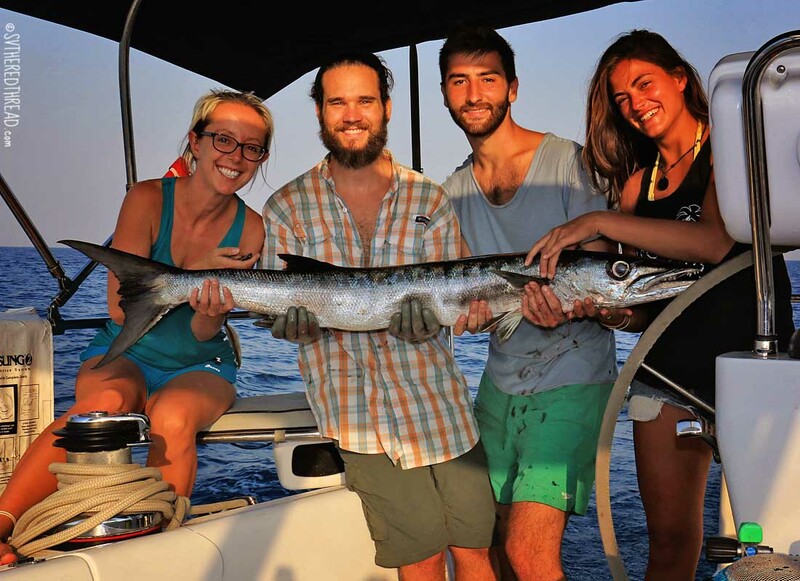 Catching the barracuda was an unforgettable moment for all of us. I’ll never forget the sense of shock that we managed to hook something to monstrous. Even after offering large, 4-person servings to each of the five officials and giving a large portion to another cruising boat, Neil, Tim, and I enjoyed two dinners. That barracuda’s life did not end in vain. Neil’s reflections: Coming out of the estuary was a little rough, with swells hitting us broadside as we traversed the sandbar. In retrospect, I think that’s probably what did poor Timur in. The most striking aspect of this passage was just how calm it was after we exited the estuary. While trying to maximize our sailing is important to us, when the wind speed allows us less than two knots of boatspeed, it’s hard to want to wait for the wind to pick up, especially when Emma had a plane to catch. While hauling in the barracuda, I was certain we’d caught a wahoo, which we’d heard is delicious fish. However, that is one that has avoided our lures to date. 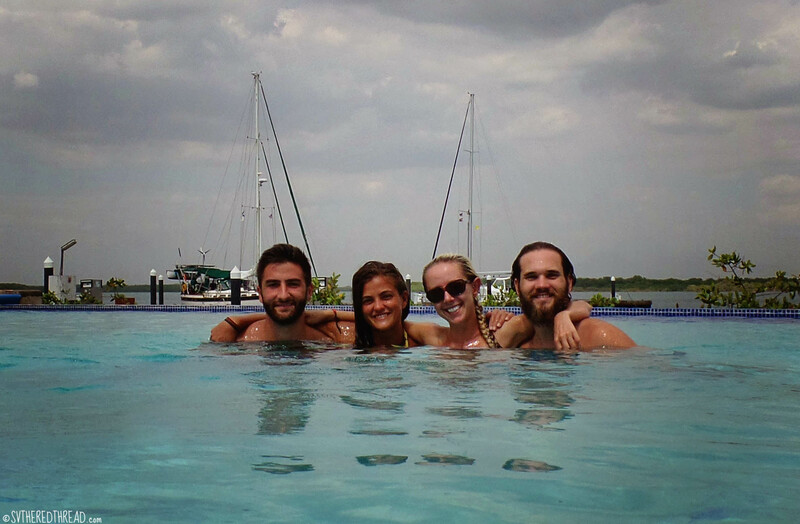 My favorite part of Puesta del Sol was the infinity pool, which we jumped in just before Emma set out for Managua. 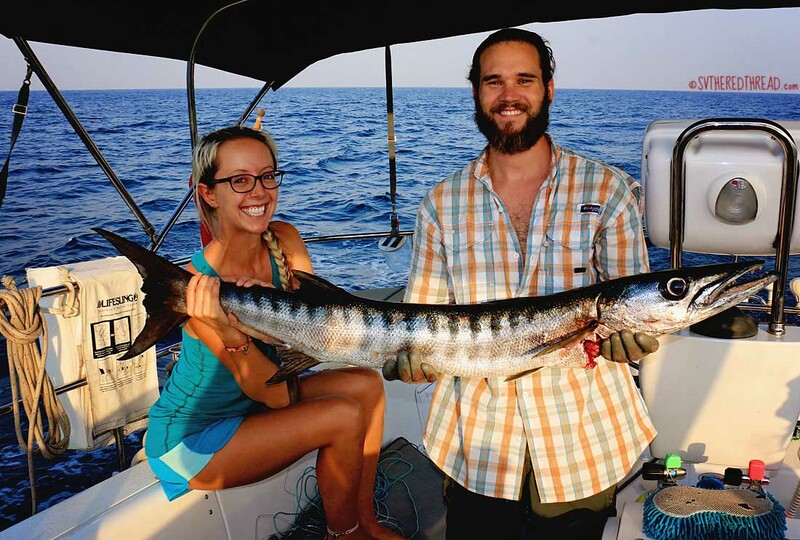 This entry was posted in By Jessie, Central America, El Salvador, Fishing, Friends and loved ones, Nicaragua, Passages, South Pacific Stitch, Wildlife and tagged Blackfin barracuda, Puesta del Sol Marina. Bookmark the permalink. That is a MONSTER fish!